When you’re looking for quality apparel and accessories at a great value, the Port & Company® collection is the natural fit. With Port & Company, you’re sure to get an exceptional price on well styled clothing that’s made to last. This collection has an incredible range of apparel for kids and adults with a focus on everyday wear including t-shirts, sweatshirts, headwear and basic, all at an irresistible value. Port Authority® and its related family of brands offer a full spectrum of apparel and accessories from casual to corporate wear. The Port & Company - 5.4-oz 100% Cotton T-Shirt is a perfect example of the amazing quality, style and efficiency that Port & Company provide. The uses of this top are limitless, it is ideal for anything from a local sports or college team to a corporate uniform. 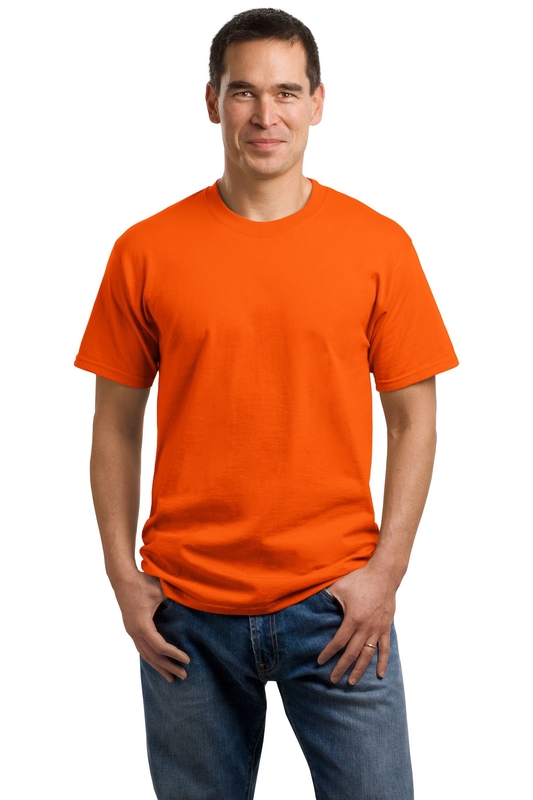 Port & Company t-shirts’ are available in most popular team colour combinations. The Port & Company collection ranges from performance apparel to athletic heritage and casual streetwear. The colour range is ensured to be the best you will find. Aquatic Blue, Ash, Athletic Heather, Athletic Maroon, candy Pink, cardinal, Carolina Blue, Charcoal, Clover Green, Dark Chocolate Brown, Dark Green, Dark Heather Grey, Gold, Heather Athletic Maroon, Heather Dark Chocolate Brown, Heather Navy, heather Purple, Heather Red, Heather Royal, Heather sangria, Jet Black, Kelly Green, Light Blue, Lime, natural, Navy, Neon Blue, Neon Green, Neon Orange, Neon Pink, Neon Yellow, Olive, Orange, Pale Pink, Purple, Red, Royal, sand, Sangria, Sapphire, Silver, Steel Blue, White and Yellow. This colossal colour range is brilliant for brands and teams. The t-shirts are also easily customized. An indispensable t-shirt in a classic silhouette and our lightest shirt yet weighing 5.4 ounces of 100% cotton. However, Ash is 98/2 cotton/poly, Athletic Heather is 90/10 cotton/poly, Neon Blue, Neon Green, Neon Orange, Neon Pink, Neon Yellow, Dark Heather Grey, Heather Athletic Maroon, Heather Purple, Heather Navy, Heather Red, Heather Royal, Heather Sangria, and Heather Dark Chocolate Brown are 50/50 cotton/poly. The Port & Company - 5.4-oz 100% Cotton T-Shirt consists of a tag free label, cover seemed neck, 1x1 rib knit collar, Shoulder-to-shoulder taping and a double-needle hem. Port & Company ensure a great fit for any man. Adult sizes go from S, M, L, XL, 2XL, 3XL and 4XL.